Dang! Summer sure made a sneak attack on me. My kids are officially on summer break. What? Yup. I know. Crazypants. I really do love having the boys home for summer. And I really LOVE the un-structuredness of summer. No schedules. Sleeping in. Trips to the library to stock up on summer reading. Lots of pool time. And beach time. And lake time. And more pool time. But, I’ll be honest…I have to try really hard to not think too much about some of my own work that is not getting done while the boys are home. Like I said… I try. But, man, sometimes the anxiety of it hits me like a brick. Or one of those rogue footballs that can too-often be found flying through my house. Anyway. Like I said…I’m working on it. Unfortunately, letting go of my to-do list is not one of my finer talents. It can really stress me out. And make me no fun. And make my husband really really annoyed at me. With this lack of schedule in the summer though, I do tend to let go and get a bit lazy in the kitchen. I end up focusing on meals that are super quick, light, healthy, and easy to prepare … because, really, when it is 115 degrees here most of summer, spending too much time over a hot stove is sooo not appealing. 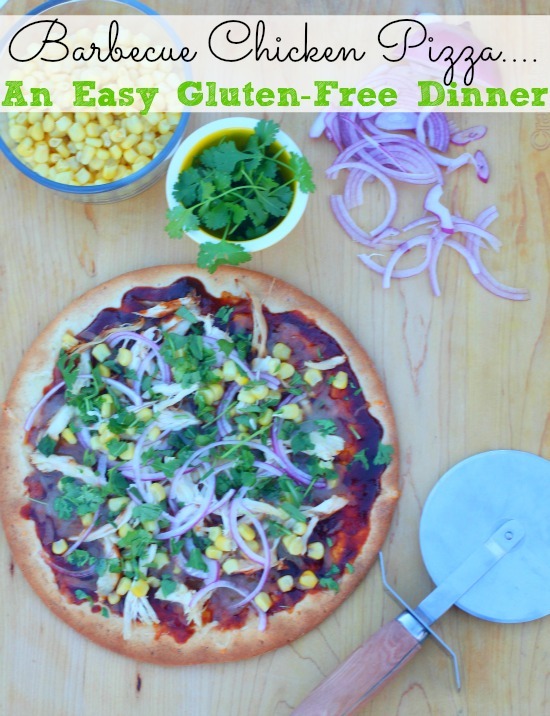 This Gluten-Free Barbecue Chicken Pizza definitely ends up being a regular guest around here. It uses leftover chicken, a few fresh veggies and herbs, and prepared pizza crusts. We don’t do a ton of grains around here though, so when I’m feeling ambitious I will often put together an easy Almond Flour Pizza Crust for this. It all comes together pretty fast and then a quick 10-15 minutes in the oven and you end up with super simple, quick, and light meal, ready to go – and the oven is barely on long enough to heat up your house and kick on the AC…which is all my husband really cares about anyway. 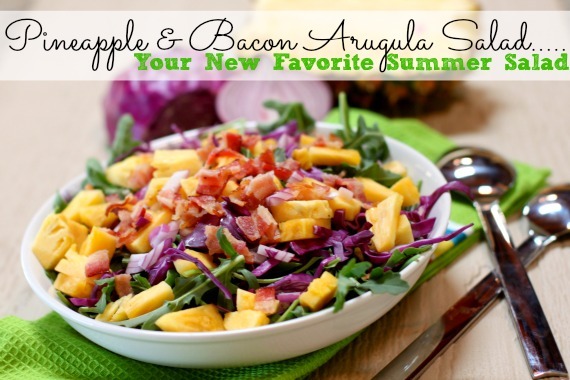 I tend to serve this one most often with our favorite Pineapple and Bacon Arugula Salad. It is a huge favorite around here and the kiddos usually devour the salad as fast as the pizza. I just throw it together in the time the pizza is baking and then dinner is done. 2. Drizzle the pizza crusts with the olive oil, dividing the oil between the two crusts. Place both crusts in the oven, directly on the rack. Cook for 5 minutes. 3. Remove from oven and spread barbecue sauce evenly over both crusts. 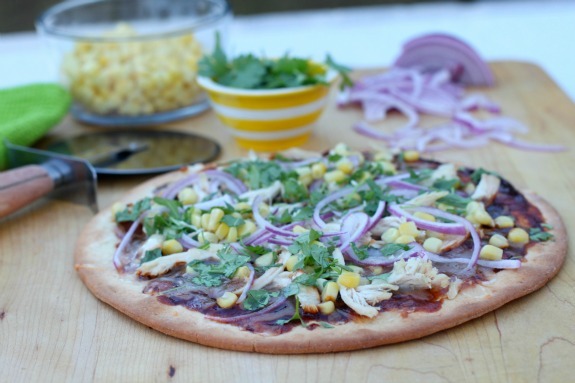 Top with the shredded chicken, red onion, corn, and sea salt. Then spread cheese evenly over both. Bake for 5 more minutes, until cheese is bubbly. 4. Remove, top with chopped cilantro, and slice. Serve with Pineapple and Bacon Arugula salad or other salad of choice. Are your kids out for summer yet? Can’t wait to add this to my summer dinner rotation! Thanks Kim! Yum, this is one that I need to make again! We used to love barbecue chicken pizza! Pizza looks good but I’ll have the salad please. YUM!!!!!! A great pizza for entertaining too! I’m pinning this on my newly created “Entertaining” board! Totally inspired by this recipe! Enjoy your summer with those gorgeous boys. Kim, I sympathize with you and all of the other moms when it comes to summer vacation time. We say that we want it all, and we can have it all, but it is a very hard balance. We want to be home with our children but know that we still need to get our stuff done. That must be hard for every mom out there. I think it is great though that you are finding a way to balance it. The stress is there, the panic sometimes might set in, but luckily summer vacation does end. I do think that the recipe for the barbeque chicken pizza looks delicious and is a great summer time meal. This looks so good! My boys got out of school a week and a half ago. They are currently with their grandparents while Tony and I are doing the con thing for him right now. I miss them so much! I hope you guys have an amazing summer! Yum, yum! I wonder if my husband would like this… I need to try it! Have you tried making your own gluten free crust? I have a recipe on my blog that is delicious! It isn’t soggy and doesn’t fall apart. I like the touch of cilantro, ooh my mouth is watering!